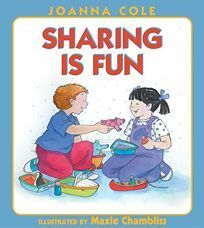 Also adding to their series for the very young, Joanna Cole once again teams up with Maxie Chambliss for Sharing Is Fun (a companion to When Mommy and Daddy Go to Work; How I Was Adopted). Andrew's friends Emily and Joshua visit him for a play date. After his mother asks him if he has any toys ""too special"" to share, Andrew puts away his teddy and other favorites; and he learns to share the rest with his guests (""Remember, all the other toys are for everyone to play with,"" says Mommy). (Aug.) .